It’s Chiranjeevi’s birthday on August 22, and Bollystalgia has been leading a celebration of all things Sri Devi this week in Sridevipalooza. Then our copy of JVAS turned up in the mail. We haven’t seen the planets aligned in such a pleasing formation since we last watched Magadheera! It seems fitting to look at two of our favourites in one of their most enduring films. A disclaimer before we begin – The only copy of this classic film we could find was a VCD with no subtitles. So we might have made up some of what follows. The picture quality was not the best so we apologise for the dodgy looking screencaps. JVAS is a socio-fantasy starring two of our favourites, Sri Devi and Chiranjeevi. Chiru plays Raju, a guide to the local caves, who has four orphans in his care. Sri Devi is Indraja, the daughter of Lord Indra, who pops down to earth for a visit and to go frolicking in the snow. The two cross paths when Raju is skiing, hiking and climbing the mountains in search of a rare plant that will cure the medical condition of one of his foster children. 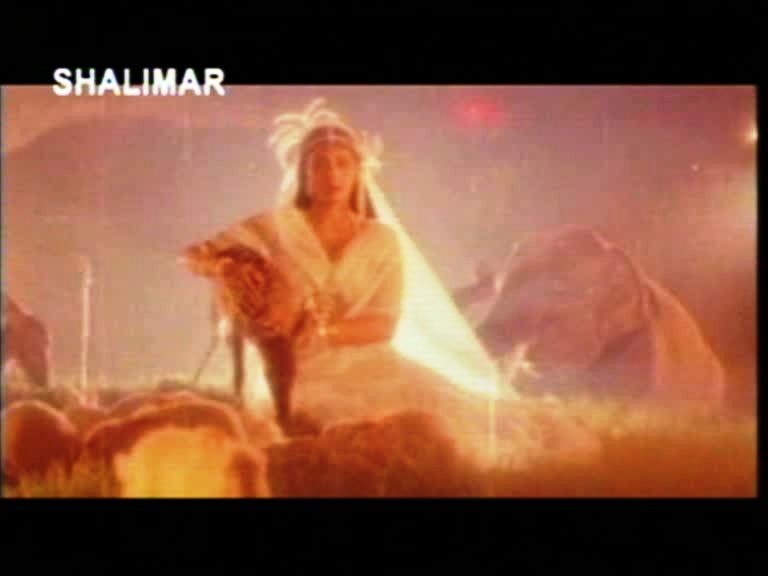 Indraja sees Raju and accidentally drops a magical ring as she flees. Her return to earth to retrieve the ring (she can’t get back into Heaven without it) sets in motion a train of events and sparks a sweet romance with Raju and his makeshift family. The mix of characters includes the aforementioned orphans, a younger than we are used to Brahmi, a suitably villainous Amrish Puri, plus an assortment of comedians and villains. Chiranjeevi’s Raju is the tough guy with a heart of gold. He loves his children, he protects his people, and he worships god and defends the faith. He dances, he romances and he dishooms with the very best. He is funny, endearing, dramatic, heroic and always compelling. From his appearance dressed as Hanuman to his prancing in a silver cape and all the varied wardrobe choices in between, he dominates the screen. His on screen relationship with the kids is sweet – he is comfortable with them, and they seem to love being around him. As we watched without subtitles, the facial expressions and body language were really important in working out what was going on. Chiranjeevi totally embodied the character and his motivations and emotions were evident without being hammy or over the top. His swagger and confidence in the fight scenes made them really entertaining. The chemistry between Raju and Indraja was very compelling. When Indraja says “Raju is a good boy” the cut to Chiru’s eyes is all you need to see to know that Raju has ideas of being a bad boy! Sri Devi is just beautiful, and perfect for this role. While the separate comedy track wasn’t particularly funny or comprehensible, her facial expressions and comic timing were excellent, and we can forgive anything when she dances. She does struggle with some unfortunate 80s fashions in her “modern earth girl” avatar, but when she goes mythological, she is breathtaking. Indraja is not the most substantial character Sri Devi has played, but she invests her with a warmth and cheekiness that is endearing. She even manages a psychic connection with the family dog that cements her place in the household! Her machinations to try and recover her ring from Raju are amusing and her growing fondness for him seems natural and not forced. Her fear and vulnerability are played well, and she shows some steely resolve in later scenes. The Illaiyaraja soundtrack is lovely and melodic. Andalalo is a wonderful opening to the film, and the picturisation has a pretty Disney cartoon fairytale quality that works so well in this genre. It’s not even trying to be real, just a beautiful fantasy. Both leads are great dancers and it is a delight to see them matched together. The chemistry between them is particularly evident in the dances, and both are given choreography by Prabhu Deva that highlights their compatibility. We don’t know why it is that Chiru, who is a stocky and not particularly tall man, can carry off some of these moves, and in lycra. We do know that he just lights up when the music begins and we can’t resist. While the first half of the film is mostly fluffy romance, the second half is much darker as Amrish Puri plays a guru who wants to kill Indraja so he can obtain immortality. Or something (we guessed). 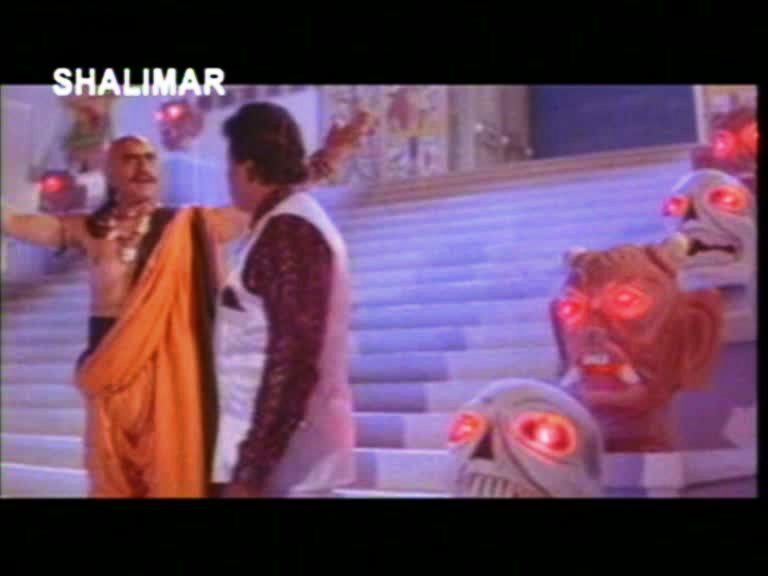 From his sweeping entrance down a grand staircase flanked by glowing eyed skulls, to his creative use of a huge pearl on a string as a hypnotic yoyo, the presence of Amrish Puri signifies Bad Things will happen. Events culminate in Chiru and the orphans rescuing Sri Devi and crushing the evil plot. But once things settle down, and Indraja has her key to the front door of Heaven (her ring), what will become of this little family? Raju and the kids know who she is and they accept that they will lose “their” Indraja. Since knowing them has changed Indraja on many levels, will she be able to leave them and return to her previous carefree existence in heaven? You will just have to watch the film to find out. Temple says: I had heard so much about this film, and tried for so long to get a copy that I was prepared to be disappointed. I wasn’t – if anything this exceeded my hopes for great entertainment. Chiranjeevi is just awesome as Raju. He has such charisma on screen, his acting and comedy are superb and he throws himself into the dances with such enthusiasm. His chemistry with Sri Devi is perfect and adds depth to the story as their relationship progresses and his character moves from amused tolerance of crazy Indraja to a deep attachment. Despite being light in tone overall, his expression of anguish and loss when he believes he has lost Indraja is heartbreaking and makes it all feel so real. Sri Devi is , of course, perfect in a role that is tailor made for her. She switches from comedy to slapstick to elegance and back and never misses a beat. I keep reading about the possibility of Charan being involved in a remake of JVAS. Much as I am a fan of Charan, I am not sure any modern version of this could add anything to improve on the original. It really is that good. The overall visual style is lovely, the music is perfectly matched to the film, the actors are at their peak; there is dancing, action and a fine effort by the wardrobe team. It just has everything! I can see why so many people recall this film with huge affection. It is full of heart and the good kind of sweet sentimentality. A resounding 5 stars from me! Heather says: This is a delightful film. There is so much to look at, with some beautiful costumes, great set design and of course Sridevi and Chiru. Both leads are their charismatic best in this film and together create a magical feel to the story. Sridevi is luminous as Indraja and even in her Earth avatar she creates an aura around her character. Her comedic timing is as flawless as ever, and she portrays innocence and compassion with total ease. The children are amazing, great performances from such a young cast – and not just token orphans either, they each did have important roles to play in the story. And of course this film has Chiru in top form – who can resist him when he is saving the day, (and the heroine plus orphans of course) with such panache and flair. Certainly not me! The looks exchanged between Sridevi and Chiru as they fall in love are just sizzling and the empathy between the two when dancing put this pairing right up there with the greats for me. Totally enjoyable film even without subtitles. I give this film 5 stars! This entry was posted in Sridevipalooza, Tollywood and tagged Chiranjeevi, Chiru, Happy Birthday Chiranjeevi, Illaiyaraja, Jagadeka Veerudu Athiloka Sundari, JVAS, Magadheera, Prabhu Deva, Sri Devi, Sridevipalooza, Telugu, Tollywood. Bookmark the permalink. Oh! I was HOPING it was this film when you mentioned Chiru + Sri!!! I LOVE this movie! It’s the only Telugu movie I’ve ever seen, but I absolutely adored it. Sri is the ONLY person who can play a celestial being to a T – her beauty is totally ethereal and otherworldly (anyone who is scoffing at me and coughing “plastic surgery” under their breath, shut up! She was ALWAYS gorgeous). And Chiru is everything you guys said, manly w/ the heart of gold, able to convey sexiness with those incredible eyes, etc. I loved Baby Shyamalee is the youngest kid – I’m a big fan of her sister Shalini, and I hope Shyamalee hits the screen as a heroine soon because she’s always had the chops. And the songs!!! Andalalo is gorgeous and a world I just want to drop into and skip around like Chiru. Yamaho is one of my favorite dance numbers and I didn’t know before that Prabhudeva choreo’d it. No wonder! And I’ve already posted about Abbani Tiyani Dabba. That song was RIDICULOUSLY popular and its SO much better than its Hindi avatar, Madhuri’s Dhak Dhaks be damned. Thanks for this great review! Linking up now! hmm.. 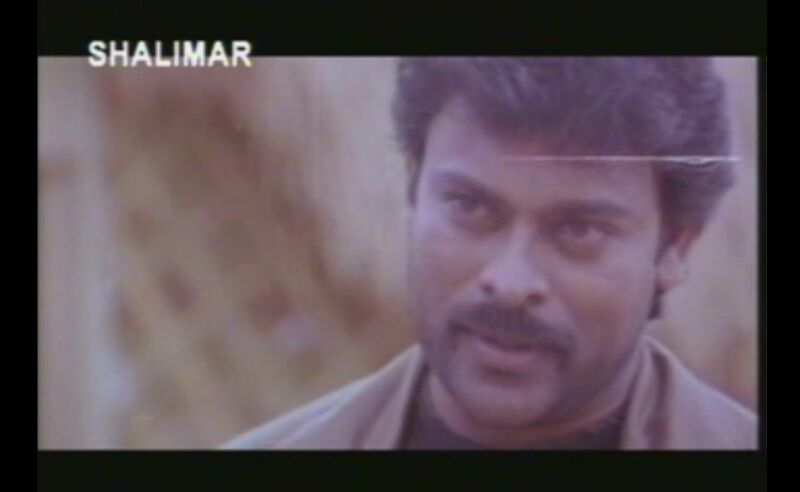 This is one of my fav Chiru movie.. starnge being a Telugu guy.. I havent watched most of Chirus movies until last 3-4yrs.. Have become a big fan of him since then..I might have watched Chiru old movies but not keenly observing only Chiru.. Chiru.. the one word which makes people of Andhra Pradesh go mad about.. Any dance.. compare it with Chiru.. acting.. compare it with Chiru’s.. Eyes.. compare them with Chiru.. hez the C/o address for many such things in Film industry.. 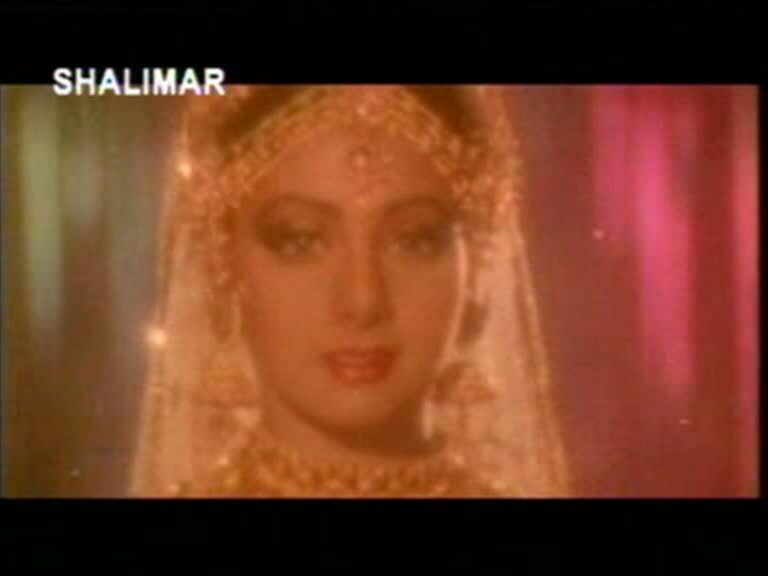 Speaking of Sridevi.. is she actually from the Indralokam ? I have never seen an actress playing a role as if she does the same in her real life.. Shez the most gorgeous in the movie.. but I rate her acting the best in “Vasantha Kokila” ( acts as a girl who lost her memory ) and “Kshana Kshanam ” ( acts as a god fearing innocent girl who is framed for a murder which she did not commit ) .. Even to my Chiru-resistant brain, this DOES sound fun! You will appreciate my GAK-SNORT-HEEHEE as I was reading along and got to “…the daughter of Lord Indra, who pops down to earth for a visit and to go frolicking in the snow.” That alone is enough to make me want to see it. And Ofcourse, this is one of my all time favorite movies of chiranjeevi, also i think Apadbandhavudu is one flick you cannot miss if you are a fan of chiranjeevis acting, although you need to be a little patient. I was born in the year this movie released. Watched it many years later and thoroughly enjoyed it. Thanks for the link – Sridevi looks even more beautiful now! Yep she looks gorgeous. Good to know you got friends who can translate for you.